NOTE: The itinerary you see here is subject to adjustments and changes at the discretion of the guides (if needed). Our journey begins as we touch down in Kagoshima – an airport with an honest-to-goodness Onsen footbath for guests. We’ll soak a bit before checking in at our hotel. In the evening, rest up OR head out to explore the city’s cool shopping district. The next day, we head into the city of Kagoshima to see just why this area is called one of the most beautiful spots in Japan. First stop: Sengannen, a waterfront landscape garden with a view that is bound to inspire. 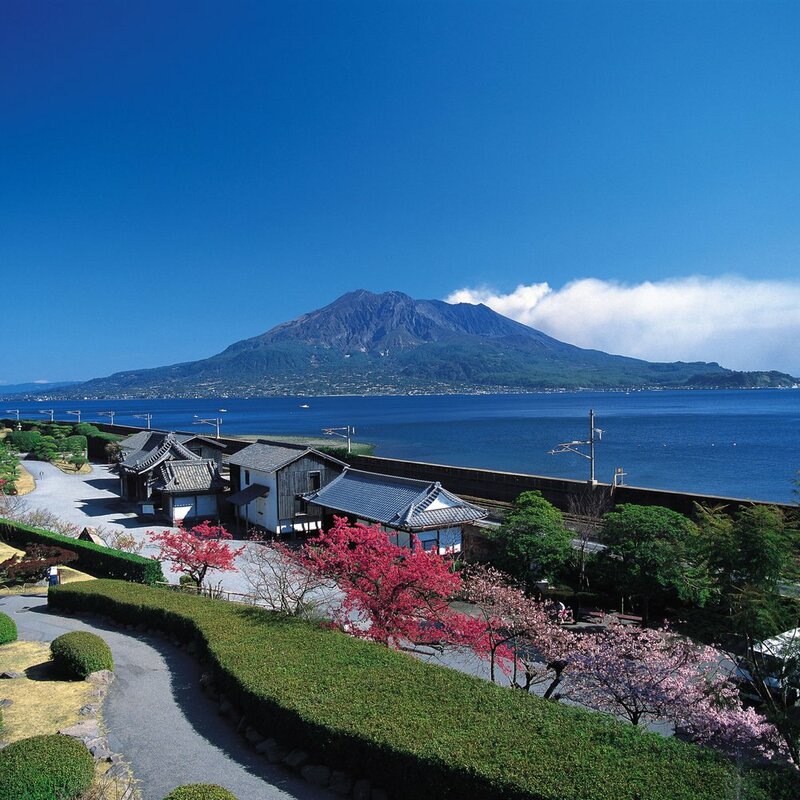 This is the spot where the Meiji Restoration began for many, so let’s ride that spirit of adventure on to our next spot: Sakurajima, a volcanic island across the bay where we’ll walk lava trails and take in mountaintop views. In the evening, we’ll head out for local cuisine at the “Yataimura,” where you’ll be able to try all kinds of local cuisine from noodles to the area’s famed pork dishes! We’ve been staring at the sea – and now it’s time to cross it. Today we board a jet-foil and cross to the mysterious island of Yakushima, which inspired the look of the Studio Ghibli film Princess Mononoke. We’ll wander through the misty forests and do some exploring of the verdant scenery before proceeding to our lodging for the night: a local inn. It’s back into the island today! After a morning hike through the forest, we’ll have the chance to make some handicrafts with the locals! Once we venture from the island center to the port, we’ll explore there before boarding another jet-foil bound for Ibusuki. Once we arrive, you’ll check in at our hotel and have a chance to wander the city a bit before calling it a night. Today, we get up close and personal with the thing that makes Ibusuki so popular: the geothermally-heated “sand onsens” near the beach! Get buried in the hot sands and sweat out any stress you have before rinsing off and checking out the island sandbar that only appears at low tide. Ready for more? Our next stop takes us across central Kyushu to Kumamoto, where we’ll check out Kumamoto Castle as its restored following a regional earthquake. New for 2019, our next stop takes us on a trip across Kumamoto’s Mt. Aso region. Before seeing the famous crater ourselves, we’ll stop to see the waterfalls on the approach and hit up a local farm for some of the freshest food (and ice cream!) you’ll have anywhere. After all these mountains, we’ll head the opposite direction – into two ends of an abandoned rail tunnel, where the citizens of Takamori have turned one side into a fantastic art museum. The other side? The fine folks of Takachiho actually turned it into a Shochu brewery, so if you’re feeling like a drink – you’re in luck! You’ve seen the waterfalls – now sail them! We board a boat (or two!) this morning to sail along the gorge and past the area’s famous waterfalls. After being part of the beauty from the water’s level, we’ll take time for lunch and make our way to the Takachiho Shrine from the scenic paths that line the gorge. In the evening, we’ll have the chance to check out one of the Yokagura traditional dances at the shrine before turning in for the night. Many adjectives have been used to describe Takachiho Gorge, and you may want to come up with a few new ones once you get there with us today! We begin with a visit to the rural Amano Iwato Shrine, where the gorges hide legendary caves where legend says the goddess Amaterasu once hid. We’ll wander through bamboo forests and check it all out before relocating to Miyazaki for the final leg of our journey. If you thought you’ve seen all the beautiful coastlines one can see in a lifetime after the last few stops, we have news for you: you ain’t seen nothing yet. Today we hit Udo Shrine, a spectacular seaside shrine with offering boxes hiding in caves that dot cliffs overlooking the waves below. 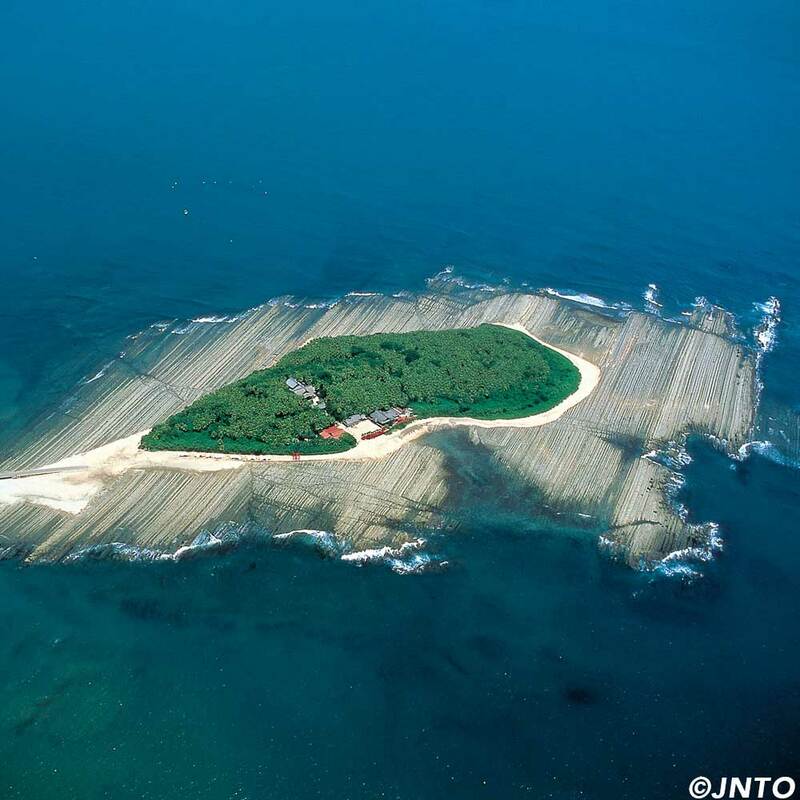 Just up the coastline lies our second stop: the “washboard” island of Aoshima! We’ll wander the odd-looking beaches of this natural marvel and explore the shrines that hide in the forests of the island. Finally, it’s back to Miyazaki City to relax! Today is a full day to relax and enjoy our resort! Take advantage of the pool, the hot spring, the beach, or the miles of hiking trails! Your guide will be on hand to help with directions and pointers on other stuff to see. Return home to tell your friends all about the amazing experiences they missed!